Toxicity: Minimally toxic in small amounts; larger mercury-containing thermometers can be toxic if the vapors are inhaled. Glass can cause physical injury. Expected symptoms: Varies based on the type of thermometer, some can cause minor irritation to the mouth. What to do: Clean up appropriately; give your child a drink of water and wash the exposed skin with soap and water. Call the Missouri Poison Center for further advice. Note: If your child has gotten the liquid in the thermometer into their eyes, call the Missouri Poison Center now for help on how to rinse the eyes. Thermometers are important to have in the house to check body temperature in an illness but sometimes they break open, spilling out the liquid inside. The information for clean-up and treatment varies based on the type of thermometer. Regardless of the type of liquid inside, broken glass thermometers always have a risk for injury from the sharp pieces of glass, so use caution during clean-up. In the past, glass thermometers contained mercury which has extra special instructions if broken. 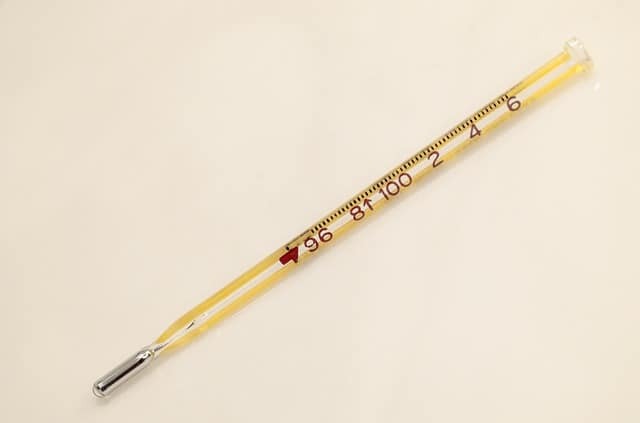 Newer glass thermometers do not actually contain mercury, but some of them contain a silver-colored liquid, so it can be difficult to tell apart. Spilled mercury from a broken thermometer breaks up into little shiny balls that move around quickly. If it does not contain mercury, the silver substance inside is considered nontoxic and symptoms are not expected if ingested. Other glass thermometers contain a colored liquid that contains alcohol. This liquid can cause irritation or a burning sensation in the mouth that will go away after rinsing with water. If your child breaks a glass thermometer, do not panic. Call the Missouri Poison Center for assistance at 1-800-222-1222. The clean-up instructions are different based on the type of thermometer. For non-mercury thermometers, simply clean up the glass carefully, wash exposed skin, and give them a drink of water if the liquid got into their mouth. If the thermometer contains mercury, the main concern with mercury is from inhaling the vapors, not from touching or swallowing it. Serious effects are not likely after a broken thermometer, but call the Missouri Poison Center for clean-up assistance at 1-800-222-1222. The poison center is open all day, every day for poisoning emergencies and questions, too.